More and more people are paying attention to the planetary perils posed by climate change. And they are asking about the role that we as individuals play in generating the greenhouse gases affecting our weather and other aspects of cliamte. A study by the European Union shows that about three-fourths of a person’s environmental footprint is attributable to the fuel consumed in transportation, food and housing. In Sweden, labeling on many food products and restaurant menus now displays the climate impact. And one of the world’s largest contributors of these heat-trapping gases is from energy-intensive livestock operations, which produce meat and dairy products. Here we feature an in-depth interview on food and climate with Dr. Rajendra Pachauri, long-time chair of the UN Intergovernmental panel on climate change, which is widely regarded as the world’s leading scientific body on global warming and related topics. 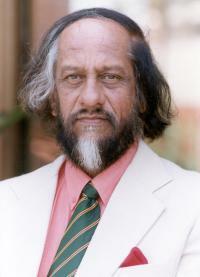 Along with former Vice President Al Gore, Dr. Pachauri received the 2007 Nobel Peace Prize. As environmental visionaries see it, the future of energy is not in greenhouse gas-emitting fuels like oil and coal—whose supply is running out—but in sustainable, non-global warming sources like wind and sun and waves from the ocean and in the enormous storehouse of heat that naturally occurs deep underground. For a limited time, this show is available to listen to free of charge.